Iron Man 2 throws you right back where the action left off in Iron Man. Tony Stark has just revealed to the world that he… is… Iron Man, and the media frenzy has begun. Accolades, adulation flow like wine, but one man is not celebrating. He is dying in a squalid apartment in Moscow watching the drama unfold on TV. His only companion is his son – Ivan Vanko. As his father, bitter and vindictive to the end, breathes his last, Ivan gets to work on an arc reactor similar to the one Stark built in Afghanistan using forty year old plans developed by his father and Howard Stark. Six months later, Tony, as Iron Man, has opened Stark Expo with a self-indulgent display that is cringe worthy. Given his level of hubris in the first movie, you are aching for someone to give him a smackdown. It only gets worse at the Senate arms committee where he embarrasses the government and humiliates his corporate rival, Justin Hammer. It’s only after the Senate committee meeting that we realize that Tony *is* getting a smackdown of biblical proportions – the arc reactor that is keeping the shrapnel from destroying his heart, is slowly poisoning him. He’s dying and the only thing he cares about is his legacy as the protector of world peace, and he will do anything to keep that glory all to himself, even alienate his best friends Rhody and Pepper. The scene changes at this point from California to Monaco for the Grand Prix, where Tony finally encounters Ivan Vanko as Whiplash. From this point on, the film chugs along slowly, setting Vanko up as Justin Hammer’s go-to guy for destroying Tony, the degeneration of Tony’s personal relationships and the loss of one of his Iron Man prototypes to the US Military. It doesn’t pick up again until Hammer’s presentation at Stark Expo, which sparks the final action packed third of the movie. 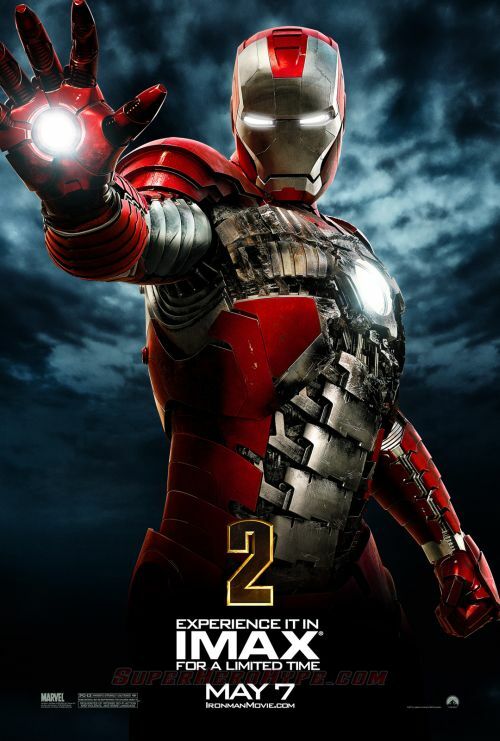 I enjoyed Iron Man 2. It has its problems, mostly with the melodrama involving Tony and his father which drags the movie down during the middle of the film. It also criminally short changes several characters: Pepper Potts, SHIELD’s insider Natasha Romanoff aka The Black Widow, but worst of all Ivan Vanko and Justin Hammer. Mickey Rourke could have made a great villain, but he’s given so little to work with in terms of back story and motivation. The scene that he shares with Tony is lifeless. Rourke is so bogged down in his accent, that he isn’t able to generate any passion for his cause. He is neither menacing or sympathetic. 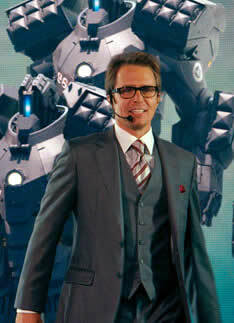 As for poor Sam Rockwell, he does a great job playing a buffoon. I can see shades of Guy Fleegman from Galaxy Quest in Justin but in Tony Stark’s chief rival, that is a bad thing. Hammer has all of Tony’s arrogance but none of his charm or intelligence. He’s that nerd from high school who had the clothes, had the car, had all the trappings of popularity, but was such an imbecile that his financial standing didn’t matter – he would never be accepted, he could never get the girl. At no point in the movie do you actually believe that Justin Hammer is ever a real threat to Tony Stark, either personally or professionally. Pepper and Natasha are also one note characters. Pepper is reduced from Tony’s patient, witty, competent foil to being nothing more than a screaming shrew. She is never able to make a point, or go toe to toe with Tony as she once did. She is completely impotent. As for Black Widow, she could have not made it into the movie and I don’t think you would ever notice. The role that she played in terms of the story could have been better served by Pepper, rounding out her character and role as Tony’s most capable associate without the movie losing anything except skin tight leather. None of these players ever really challenge Tony in the end, for better or for worse. It’s disappointing if you’re thinking in terms of this movie and this movie only, but it has interesting potential if you look at it in terms of the greater story arc. At the end of Iron Man 2, Tony Stark has yet to be successfully challenged by anyone. His greatest enemy is yet to come. His greatest enemy, ultimately, is himself. And that premise sets up for a for a truly delicious sequel. I just hope Jon Favreau and his team of writers are up for the task. Visually, the movie is stunning, although there was one effect during Scarlett Johansson’s fight scene near the end that bothered me. There seemed to be some sort of double exposure on her movements that was distracting and honestly hurt my eyes. I know it wasn’t just me because DH mentioned it as well. I’m not sure if it was the print of the film, or some sort of special effect, so I’ll be interested to hear if anyone else saw the same thing. All and all, Iron Man 2 was a fun film. It didn’t quite live up to my expectations, I was hoping to see an expanded role for Pepper Potts, as well as more interaction between Nick Fury and Tony Stark. 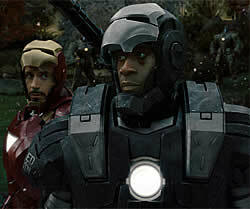 Sam Jackson and Robert Downey Jr. sparkle when they’re on screen together. 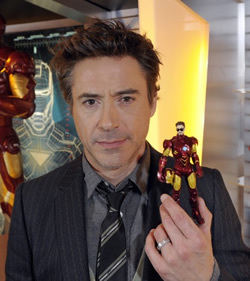 The film maintained its humor throughout – no one quips like Robert Downey Jr. Happily, Don Cheadle walked into the role of James Rhodes and nailed it. He was with Downey beat for beat and I actually preferred his characterization of Rhodes to Terrence Howard’s who struck me as whiny and self involved. It will be interesting to see where Tony and James’ relationship goes from here. I do think it’s a fine set-up for both The Avengers movie and the next Iron Man sequel. 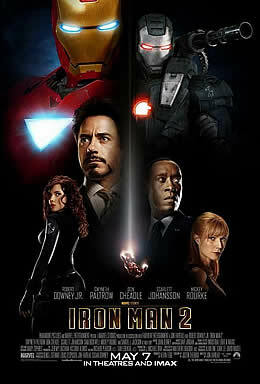 For those who are wondering, Iron Man 2 is definitely worth seeing in the IMAX format. The scene where Iron Man and War Machine are being chased through the Stark Expo grounds is amazing and definitely worth the extra coin. BTW, stick around after the credits for a teaser of epic proportions.